Angelina Jolie Can’t Act…And I Can Prove It! Yes, that’s right. Angelina Jolie can’t act to save her life. She also can’t sit still for more than a couple of minutes. Last night I saw living proof. Anyway, I got my large coca-cola and medium popcorn (no thank you, I didn’t want to Super Size it), and found an empty seat and got ready for what I believed would be a fairly intriguing spy thriller. Big mistake. First of all, I won’t even attempt to explain the plot which is the most contrived and convoluted manner I’ve seen in a very long time. (Note to the films writers: The Cold War ended with the Reagan Administration) Secondly, the majority of acting and plot development takes place in the first ten minutes of the movie. For the remaining hour and 20 minutes we see Angelina in all manner of movement and action. And when it comes to action, she is truly superhuman. She busts out of every sort of secured room and building every constructed in Washington, D.C and hits the road, with her A.D.D still raging. Perhaps the most ridiculous part of the film takes place in a church, which Salt destroys quite effectively – even finding a way to cut through the floor where the Russion President is standing so he goes falling into the bowels of the church. Yeah, right. She’s also quite talented when it comes to the both martial art skills and weaponry. 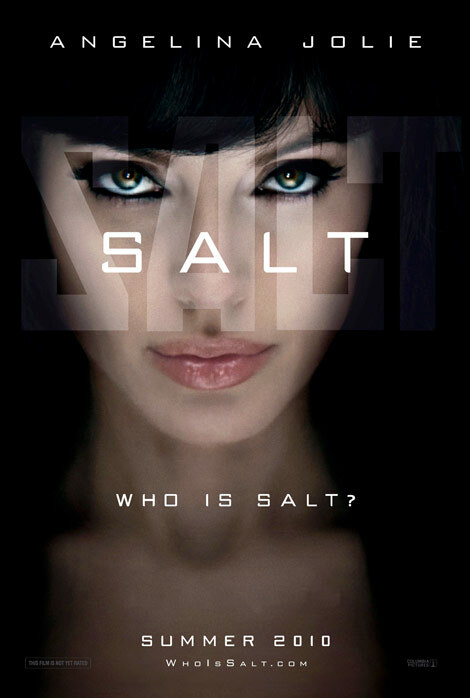 When she’s not imitating Jackie Chan knocking out a whole phalanx of bad guys (or are they good guys), Salt turns into a deadly assassin and the death toll escalates to record breaking numbers. She also carries with her a lethal poison taken from a spider that her husband was keeping, you know, just in case. And she uses it. But then it turns out it’s the poison was not really lethal. Tricky, tricky. I believe there’s also a scene where she climbs to the top of the Empire State building, vaulting the skyscraper from the outside. (No, wait, I’m sorry. That was King Kong. My bad.) Anyway you get the picture. With all this running and jumping and kicking and thrashing and killing, there’s not a second for Jolie to show her acting chops. And my theory is that she doesn’t have any, so she favors roles where her acting won’t really be testing. The last Angelina Jolie movie that I saw before “Salt” was “Wanted” and it was the same exact deal. Ditto for “Mr. and Mrs. Smith.” And the majority of her other roles. She’s a fraud as an actress. The only real intrigue I found in the film was trying to figure out what super-human double agent was able to negotiate a multi-million dollar deal for a film in which Jolie’s body-double/stuntwoman is on screen more often than she is. I’m not totally suprised that this film is among the top box office hits. It seems to me there was a woman named Sarah Palin who recently tried to pan herself off as a political candidate and she turned out to be another bad actress. The fact of the matter though is that Angelina Jolie simply is unable to act. If you want more proof, just go see one of her movies. “Who Is Salt,” the billboards and bus signs around the country inquire. She’s a really terrible actress. Or better yet, save your $10.50 and just watch a trailer. That should be all the evidence you need. THANK YOU. Finally someone who sees her overly hyped fame.